I made this recipe in my Pressure Cooker tonight but it could be made the same way and baked in the oven. 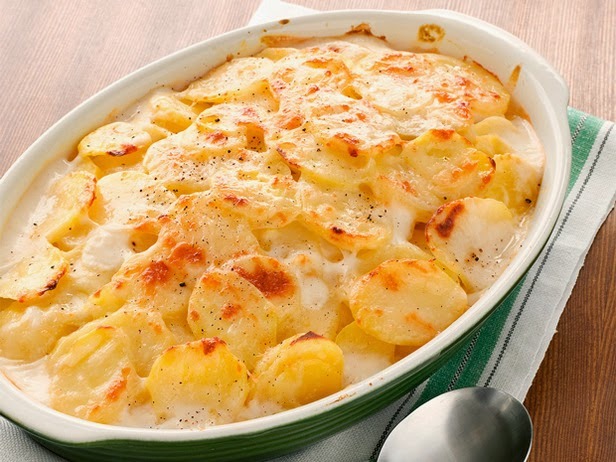 When I have made it in the oven, I just layer it in a casserole dish, and I heat the milk before I put it over the sliced potatoes, ham, flour and butter. Bake covered for an hour until the potatoes are almost tender, then uncover to get the top browned slightly. Spray a heat proof bowl or a metal bowl that will fit in the pressure cooker on a rack. In that bowl layer sliced potatoes, ham and onion. Sprinkle with 2 t. of flour mixture. Put a couple pats of butter on flour. Repeat the layers two more times. Pour 3/4 cup of milk over the top. Put 1 1/2 cups of water into the pressure cooker cooking pan. Put the rack in and place the bowl on the rack. Cover the bowl with foil.